I was itching to know what, if anything, Amygdala meant and a quick Google search turned up the following: It is a set of subcortical nuclei that is important for perceiving in others and having in oneself emotional or affective behaviors and feelings (e.g. fear, anger). It is, therefore, a component of the limbic system. Now that you know that… Amygdala is also the Japanese duo of Yoshiyuki Nakajima on keyboards, synths and programming and Yoshihiro Yamaji on guitar, bass and vocals. Nakajima composed all the music. And the CD credits aroused my curiosity by noting that Yamaji is in the band Tyrant. I've never heard of them but a quick Google search reveals them to be a Black Metal band. 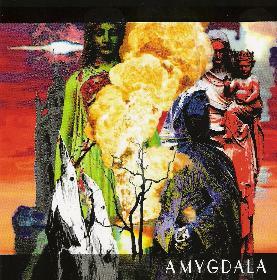 Amygdala isn't a Black Metal band, but rather play a zheul fueled brand of avant-prog/RIO with blatant references to Magma, Univers Zero and Present. From the first moments of the opening track, "Utrecht", a thunderous zheul sound crashes over the listener like a tital wave, like Magma as a metal band, before launching into a blazing avant-prog jam. This is very heavy, HIGHLY intense music, with exciting arrangements and instrumentation. "1998" and "Db" are highlight tracks that get more into Univers Zero/Present territory… very much like Present really. Nakajima's compositions are impressive, providing the listener with much to digest over repeated listens. And the performances are mercury bursting with power and emotion. "Bernoulli's Organ" is one of my favorite tracks, being like an instrumental gymnastics exhibition where everyone is lit up on steroids. How the hell do only two musicians perform this music? And what about the drums? There are no drums in the credits, just programming, so if these aren't real drums then these guys are doing a mighty impressive job with the programming. In summary, Amygdala are by no means doing anything new or different. But if you're a fan of zheul and RIO school progressive rock you will surely appreciate that what Amygdala do… they do damn good. Heavy rockers into complex prog will drool buckets over this stuff. For more information you can visit the Soleil Zheul web site at: http://www.soleilzeuhl.com.